To get the most out of your stay go say hi to our Concierge team and ask them what they would do in Vegas. With so many options it’s worth referring to the people who know Vegas best. We're just as obsessed with your four legged friends as you are. 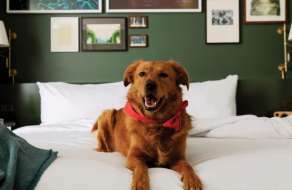 We know you'd spend your whole vacation with them if you could, but for those times you have to step out, our Concierge team is happy to help make your pup feel right at home. We'll pop into your room while you're out to check on Spot and even take them out for a stroll around our neighborhood. We don't want your pupper to feel lonely while you're out at a meeting or grabbing a quick cocktail. We'll stop by and check on your favorite furry travel companion while you're out. We'll even send you a text message to confirm everything is OK.
We know some pups need a few more bathroom breaks than others. We're happy to take Spot on a quick stroll to the pet relief area. We'll take your furry friend on an adventure to explore The Park. They'll have time to drink in the scenery and stop by the pet relief area. We'll send you a picture to keep you up to speed on your pup's tour through our neighborhood. Have questions about airport shuttles, finding the tram to Bellagio, or M life Rewards? The answers to these questions and more are available on our FAQ page.